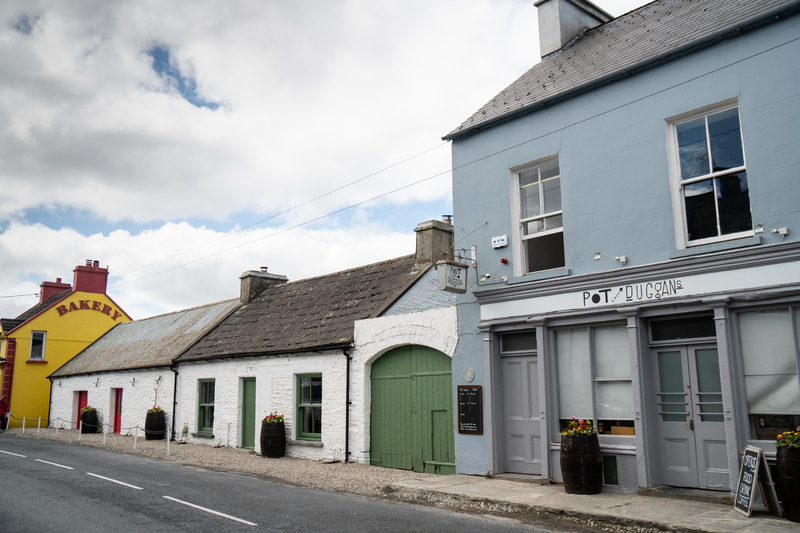 Nan Ahern’s pub was a known landmark in the busy little market town of Ennistymon, once the home of the Ahern family who ran the bar, a grocery and a milk distribution. Nan made butter and sold it from the snug and her father held cattle marts in the courtyard in the fifties when he ran things. Nan herself, a fascinating character who was renowned for hosting serious hoolies in the basement until all hours, ran the pub for many years on her own up until she passed away in 2016 – in her nineties. The beautifully unique wild Atlantic coast draws people from all over to this part of the world, and to the many small towns including and surrounding Ennistymon, which is just a short drive to Lahinch and to the Cliffs of Moher. Famous for once having the most pubs per capita in Ireland – fifty two in total, now just nine – the town is known for it’s many traditional shopfronts, the Falls and cascades, the traditional music scene and horse fairs. It’s a colourful place filled with innovative businesses and a thriving community of creative people. We felt a lot of responsibility when we stepped into Pot Duggans in 2017 to respect the history and character of the much loved old pub. We did our very best to give the place a new lease of life, bringing light and warmth to the dusty old corners, using many of Nans things exactly as she had for years before. The top shelf in the bar is still lined with old bottles you may not see anywhere else, the old stools still sometimes dragged up to the bar. We focused on working with local tradespeople to do things such as make the wooden benches that are in the courtyard, and we sourced all of our beers and spirits from Ireland. In our first year we kept things simple with food, using local ingredients from Moy Hill farm and serving weekly toasties, soups and stews. We took a few months out in the winter, renovating the rooms above the pub to rent out on Air BnB, renovating the barns attached to the pub, creating a multi purpose space that can be used for weddings, music events and film screenings, and also creating a beautiful garden and seating area down by the river. We opened for our second season welcoming two guest chefs, Brianna and Ashley, whose tasty, unique menu quickly put Pot Duggan’s food on the map. We had many great gigs, craft fairs, and events in the barns, we had poetry nights by the fire in the basement, started a ping pong tournament and we really started to feel like we had established ourselves and been welcomed in the community. 2019 will be our most ambitious year to date. We have lots of well knowns artists from the music industry joining us in our barns, along with plans for some of Bodytonics well known festivals to join us over here in the West. The new chefs in the kitchen will be serving up hearty pub grub done our way. We are so excited to see what this year brings and we can’t wait to see you here! For info on all the events we have confirmed so far just click here.